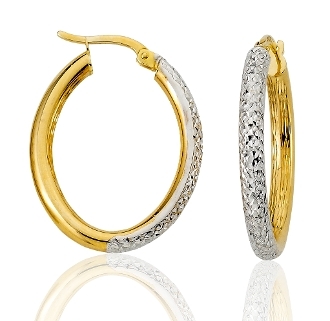 Simple, striking and perfect for everyday wear; these eye-catching oval shaped hoops are a great business to casual look. Masterfully crafted in luxurious 14 Karat yellow gold the front shimmers as light reflects off the snakeskin style white gold. Polished to a brilliant luster these tube hoops secure comfortably with hinged snap backs.